(Purely personal view). As I have said before, I am pleased to find that two decades after I began to make the arguments I made and present the evidence that I presented, finally someone in Romania is embracing my arguments and evidence. It is just too bad that Madalin Hodor appears incapable of admitting where he has gained inspiration, the sources he uses, and where he gets some of his ideas and information from. If in previous cases, it appears that Hodor is simply being dishonest and engaging in an all too common Romanian device–plagiarism of various degrees–here I suspect he simply is unfamiliar with what I have previously written. Still as a researcher it should be incumbent upon him to do his homework, he should know better, and he should give credit where credit is due. Sunt convins că viitorul (şi poate noi do­cumente) va lămuri pe deplin acest episod şi îl va aşeza în contextul lui corect, din­colo de orice speculaţii, şi nu mă aştept ca interpretarea mea să fie receptată cu prea mare entuziasm. Din contra. Cred că sun­tem în continuare (şi vom fi mult timp de acum încolo), în ceea ce priveşte eve­ni­men­tele din decembrie 1989, prizonierii unei propagande îndelung şi abil între­ţi­nute, care amestecă rusofobia noastră se­cu­lară cu ostilitatea faţă de Ion Iliescu (jus­tificată de politica lui ulterioră), in­te­resele financiare ale aşa-zisului „Dosar al Re­vo­lu­ţiei“ cu „Omerta“ prin care ser­viciile i-au protejat zeci de ani pe cei care au in­trat în structurile lor mânjiţi de sân­gele re­volu­ţionarilor, incompetenţa unor pro­cu­rori militari (de exemplu, Dan Voi­nea), cu im­pos­tura unor istorici şi jur­na­lişti şi, nu în ultimul, rând apetenţa pen­tru „cons­pi­ra­ţii“ şi „comploturi“ a unui public uşor de manipulat, cu nevoie de jus­tiţie. Although I have written a good deal on the “tourist” conundrum in the past (see, for example, Hall 2002), I have not formally addressed the role of foreign histories of Ceausescu’s overthrow in the historiography of December 1989, particularly in regard to this topic. In the wake of the broadcast of Brandstatter’s “Checkmate” documentary in February 2004, Vladimir Bukovski’s invocation of journalist John Simpson’s 1994 article on the topic (discussed in Part 2 of this series) suggests, however, that it needs to be broached in greater detail. Moreover, as the year-long look-back at the December 1989 events in “Jurnalul National” shows, the “tourist” question—somewhat surprisingly to me—has become more and more central to arguments about the Revolution, thereby amplifying what is already tremendous confusion over the events in the Romanian press and public. Of course, as has traditionally been the case, the Soviet/Russian tourists figure prominently, and, to a lesser extent, the Hungarian tourists. However, the stock of other tourist groups has also gone up. For example, the role of Yugoslav (specifically Serb) tourists has found a greater emphasis, and, seemingly out of nowhere, so have East German/STASI tourists! The principal sources for all of these allegations are, as usual, former Securitate and Militia officers, with some military (intelligence) personnel thrown in for good measure. The pilot of the helicopter was in fact Vasile Malutan, an officer of the Securitate’s V-a Directorate. What kind of a person would it have been at that time—and how credible could that person have been–who has the pilot as an old friend and “many friends in the police?” And it would have been one thing perhaps two months after the revolution to talk about the presence of foreign agents “observing” events in Timisoara, but to deny the spontaneity of the demonstrations and denigrate Tokes’ role at this juncture is highly suspicious. I have been unable to unearth additional information on Mr. Corpacescu, but his revelations just happen to serve his friends extremely well—particularly at at time when the prospect of trials and jail time, for participation in the repression in Timisoara and elsewhere during the Revolution, still faced many former Securitate and Militia [i.e. police] members. Without question, something is happening with this trial. The Securitate doesn’t say, but it suggests. It let’s small details ‘slip out.’…Increasingly worthy of interest are the reactions of those on trial….Traian Sima (the former head of the county’s Securitate) testifies happily that, finally, the Securitate has been accepted at the trial, after having been rejected by Justice. Filip Teodorescu utters the magic word ‘diplomats’ and, suddenly, the witness discovers the key to the drawer with surpise and declares, after five hours of amnesia, that in Timisoara, there appeared in the days in question, foreign spies under the cover of being journalists and diplomats, that in a conversation intercepted by a mobile Securitate surveillance unit Tokes was reported as ‘well,’ and that all these (and other) counterespionage actions that can’t be made public to the mass media can be revealed behind closed doors to the judge…. [Timis County party boss] Radu Balan ‘remembers’ that on 18 December at midnight when he was heading toward IAEM, he passed a group of ten soviet cars stopped 100 meters from the county hospital. (It turns out that in this night, in the sight of the Soviets, the corpses were loaded! ).” [emphasis in the original] (Flacara, no. 27, 1991, p. 9). The reference to the corpses being loaded is to an operation by the Militia and Securitate on the night of 18-19 December 1989, in which the cadavers of 40 people killed during the repression of anti-regime protesters were secretly transported from Timisoara’s main hospital to Bucharest for cremation (reputedly on Elena Ceausescu’s personal order). We can agree with Ionel Bejan in one respect. One thing is for sure: these were some very strange tourists. (They give a whole new meaning to the term, “adventure tourism.”) As curious as the “Soviet tourists” themselves is how little the Romanian authorities who claim to have seen them did to stop them—or even try to collect more information about them. Why is it that no official questioned the enigmatic “Soviet tourists” or asked them to leave the area when, as Radu Balan claims, he saw ten LADAs outside the Timis county hospital at 1 AM in the morning the night the cadavers of protesters were being loaded onto a truck for cremation? Or, as Ionel Bejan claims, he spotted several of them in the center of Bucharest at 2 AM, when the area was essentially a warzone of regime repression? The regime had closed the borders to virtually all other foreigners, tourists or otherwise, it was trying to prevent any word of the repression from reaching the outside world, and yet Romanian authorities were not concerned about these “tourists” taking pictures or relaying what they were seeing?! WHO COULD THEY HAVE BEEN? Nicu Ceausescu, Nicolae’s son and most likely heir and party secretary in Sibiu at the time of the Revolution, claimed that he also had to deal with enigmatic “tourists” during these historic days (the following several paragraphs borrow heavily from Hall 2002b). From his prison cell in 1990, Nicu recounted how on the night of 20 December 1989, a top party official came to inform him that the State Tourist Agency was requesting that he — the party secretary for Sibiu! — “find lodgings for a group of tourists who did not have accommodation” He kindly obliged and made the appropriate arrangements (interview with Nicu Ceausescu in “Zig-Zag,”, no. 20, 21-27 August 1990). “…[T]he Military Prosecutor gave me two variants. In the first part of the inquest, they [the flight’s passengers] were from the Interior Ministry. Later, however, in the second half of the investigation, when the USLA and those from the Interior Ministry began, so-to-speak, to pass ‘into the shadows,’ — after which one no longer heard anything of them — they [the passengers] turned out to be simple citizens…” (interview with Nicu Ceausescu in “Zig-Zag,” no. 20, 21-27 August 1990). “As far as the unidentified passengers are concerned, there are two possible variants: Either they were USLA fighters sent to defend Nicu Ceausescu, or they were Soviet agents sent to act with the intent of overthrowing the Ceausescu regime” (“Expres,” no. 33, September 1990). 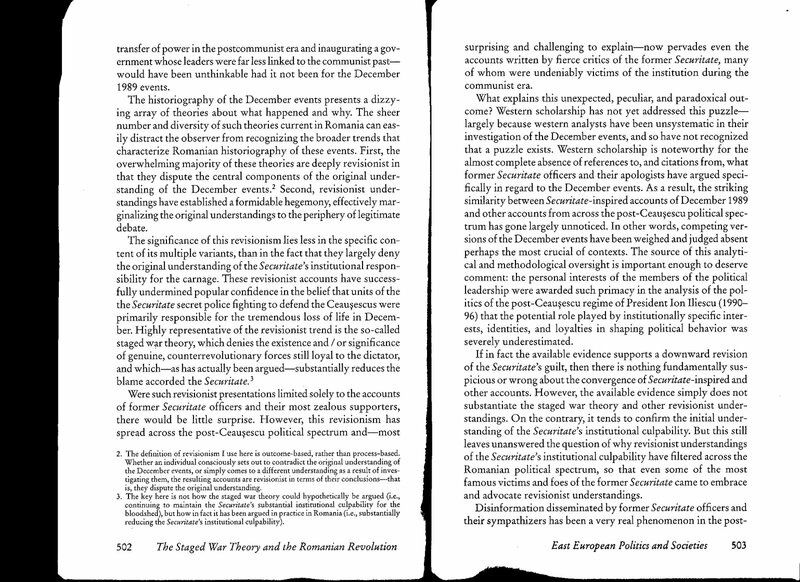 Clearly, one of these hypotheses is a lot more plauisble than the other…As I wrote in December 1996, partly based on the statements of the Military Prosecutor Marian Valer who stepped down from investigating the Sibiu events in fall 1990, citing duress: “thus as the USLA began to disappear from the historiography and therefore history of the Revolution, so the Soviet tourists began to enter it.” (Hall, 1996). Inevitably, too, in the wake of the Brandstatter film the Romanian media dragged out its old warhorse for such occassions, the former Director of communist Romania’s Foreign Intelligence Service, General Ion Mihai Pacepa, the man whose defection in 1978 led to his being sentenced to death in abstentia and whose sensational revelations about Ceausescu’s repressive and profligate rule helped erode the myth of Ceausescu in the West. Pacepa’s break from Ceausescu and the communist regime, and his stinging criticism of the administrations of President Ion Iliescu for their incorporation of and reliance upon former Securitate personnel, have led Pacepa to be lionized in the West and to be highly-respected and thoroughly-trusted among Romania’s intellectual and media elites. “Interviewer: What exactly was the essence of the the ‘Dnestr’ Plan? “Moreover, it is intriguing to note that Pacepa revealed these details [i.e. those of the ‘Dnestr’ plan] only after the December 1989 events (in his 1993 book ‘The Inheritance of the Kremlin’). Although in ‘Red Horizons’ (his 1988 detail-filled, “tell-all” book on the Ceausescus and the Securitate) he mentioned cases in which alleged Soviet agents (including Army General Nicolae Militaru…) were caught, he did not mention anything about the so-called ‘Operation Dnestr’.” (Hall, 1997, p. 117). Pacepa had no problem in “Red Horizons” revealing alleged Soviet agents in Romania and alleged secret plans by which Ceausescu’s fabled “independence from Moscow” was all a Moscow-created ruse, yet he somehow did not feel the need or desire to outline Moscow’s plan for further increasing their control over Romania through “Operation Dnestr?” This is hard to believe. Of course, that was then. By 1993—and as we have seen from the quote from the 2000 interview, continuing long after that, to the present day—Pacepa was claiming that there had been no “terrorists,” that it was all just a pretext by the KGB agents who seized power from Ceausescu (Iliescu, Militaru, Brucan, etc.) for justifying Soviet military intervention (see, for example, his comments in “Evenimentul Zilei,” 10 April 1993; 29 April 1993). The Ceausescus had been shot KGB-style to prevent them from revealing to the Romanian people and the world that the coup-plotters were KGB agents, according to Pacepa. One must ask: if Pacepa possessed this knowledge prior to December 1989—and he claims that the plan originated in 1969—and therefore had suspicions that the “terrorist” phase was merely a diversion designed to serve as a pretext for Soviet intervention, then why did he say what he said, and why did he not reveal his knowledge and voice his concerns before, during, or immediately after December 1989? The source of this quote is not Pacepa, but the well-known “protochronist,” “national communist” former Securitate officer Pavel Corut (Corut, 1994, “Cantecul Nemuririi [Song of the Undying]” (Bucharest: Editura Miracol, 1994), pp. 170, 172, quoted in Hall, 1997, p. 257). The point is, as the accusations of Pacepa discussed at the beginning of this section demonstrate, Pacepa’s claims are identical to what Corut’s alleges. By forcing an analytical, but also partisan ideological distinction by dividing protoWesterners from protochronists, as if the two were night-and-day and so easily identifiable, critical similarities such as this one—which demands attention and analysis precisely because it is unexpected—are ignored. Banyai, P., 2000a, “Pacepa: a tortenelem bizalmasa [Pacepa: History’s Confidant], “Beszelo [Speaker],” Vol. 9, September, at http://beszelo.c3.hu/04/09/06banyai.htm. Banyai, P., 2004b, “Tortenelmihamitisok es penzmosok baratai tarsasaga: Talpes, Treptow, Watts— es Tender. [Revisionist and Money-laundering Friendship Society],” “Beszelo [Speaker],” Vol. 6, June, on the internet at http://beszelo.c3.hu/04/06/06banyai.htm. 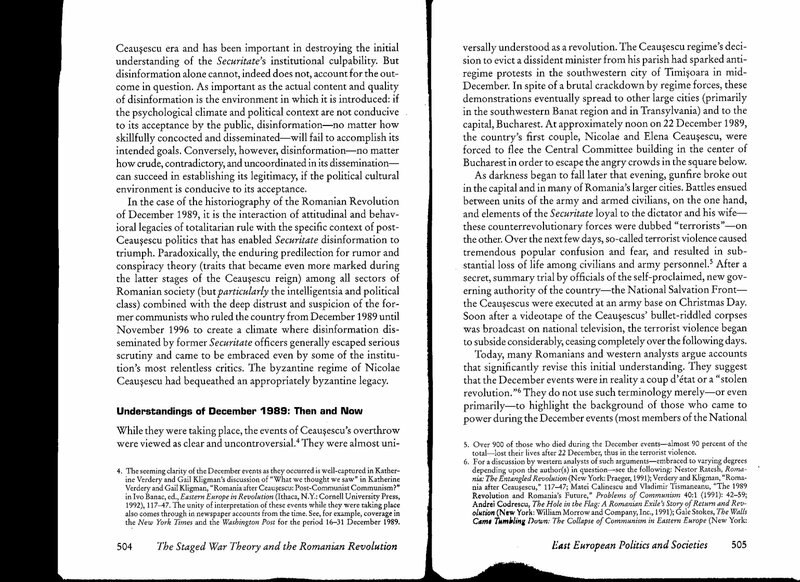 Burke, J. F., 1994, “The December 1989 Revolt and the Romanian Coup d‘etat,” at http://www.timisoara.com/timisoara/coup.html. Ciobotea, R., 1991, “Politia Politica in Instanta [The Political Police on Trial],” “Flacara,” 3 July. “Cotidianul” (Bucharest), 1999, web edition, http://www.cotidianul.ro. CWIHP (Cold War International History Project), 2001, “New Evidence on the 1989 Crisis in Romania,” (ed. Mircea Munteanu), at http://wwics.si.edu/topics/pubs/e-dossier5. Corut, P., 1994, Cantecul Nemuririi [Song of the Undying] (Bucharest: Editura Miracol). Deletant, D., 1995, Ceausescu and the Securitate: Coercion and Dissent, 1965-1989 (Armonk, NY: M.E. Sharpe). “Evenimentul zilei” (Bucharest), 1999, web edition, http://www.evenimentulzilei.ro. Hall, R.A., 1996, “Ce demonstreaza probele balistice dupa sapte ani? [Seven Years After: What Does the Ballistics’ Evidence Tell Us]” trans. Bobeica, A., in “22 (Bucharest),” 17-23 December. Hall, R. A., 2002, “Part 2: Tourists are Terrorists and Terrorists are Tourists with Guns,” “The Securitate Roots of a Modern Romanian Fairy Tale: The Press, the Former Securitate, and the Historiography of December 1989,” Radio Free Europe “East European Perspectives,” Vol. 4, no 8. Pacepa, I.M., 1987, Red Horizons: Chronicles of a Communist Spy Chief (Washington, DC: Regnery Gateway). Pacepa, I.M., 1993, Mostenirea Kremlinului [Inheritance of the Kremlin], (Bucharest: Editura Venus).